Welcome to our sing-in of Gilbert & Sullivan, designed as the London launch of Gilbert & Sullivan Choruses, which I recently edited with the broadcaster and conductor Brian Kay. In the next 75 minutes or so, we'll introduce you to most of the fourteen G&S operas, and you'll be meeting two kings, the Grand Duke of Pfennig Halpfennig, a Lord Chancellor, a Major-General, a sea captain, an executioner, a magician, a police sergeant and two spin-doctors. So, to get us off to a lively start, let's sing our first chorus, 'For the merriest fellows are we' from The Gondoliers, which is Chorus number 23 on page 179 of the book. If you haven't yet bought the book, I'll project the pages onto the screen - and if you don't read music at all, here are the words. As you can see, we have several singers here to help us, all from Oxford. The role of the gondolier Antonio has just been sung by Sheridan Edward (tenor),with David Jones conducting and Sam Baker as our orchestra, and we also welcome Taya Smith (soprano) and Jordan Bell (baritone). Gilbert and Sullivan first met at a rehearsal of Ages Ago, a work written by Gilbert with music by Sullivan's friend Frederick Clay, composer of such well-known ballads as 'I'll sing thee songs of Araby'. Ages Ago included a scene in which a picture gallery of ancestors come alive and descend from their frames - an idea that Gilbert later revived in Ruddigore. Their first collaboration was Thespis, which ran for six weeks. Most of its music is lost, though you can hear two items from it if you come to the Oxford launch of the book on 2nd October. One person who saw Thespiswas the theatre impresario Richard D'Oyly Carte, who remembered Gilbert and Sullivan three years later when he needed a short piece to follow an Offenbach opera that he was presenting in London. The result was Trial by Jury, about a case of breach of promise of marriage. Let's sing the opening chorus, which is Chorus number 1 on page 2 of the book. Imagine yourself in a Court of Law where the trial is about to start. After the enormous success of Trial by Jury, D'Oyly Carte commissioned a full-length G & S opera, and the result was The Sorcerer. It concerns a love potion which the sorcerer, John Wellington Wells, administers to a whole village at a wedding feast, with predictably disastrous results. Here, in a typical G & S patter song, the sorcerer introduces himself. The Sorcerer had a moderately successful run, and was succeeded byHMS Pinafore, which started with poor audiences due to an unusually hot summer, until Sullivan included some of its music in a Promenade Concert - Pinafore was soon the smash hit of London. The story is set on board ship and features Josephine, the Captain's daughter. Her father wishes her to marry Sir Joseph Porter, the First Lord of the Admiralty, but she's secretly in love with a common sailor on board ship, with whom she plans to elope. In this trio, the three of them discuss the situation. H.M.S. Pinafore was a victim of its own success. In New York alone there were no fewer than eight simultaneous pirated versions, none having much in common with the original production. Gilbert and Sullivan received no royalties for these performances, and vowed to beat the pirates at their own game with their next opera, appropriately The Pirates of Penzance, which they took to New York before bringing it to London. In our first Pirates extract, the pirates have captured the daughters of Major-General Stanley, but agree to release them on learning that the Major-General is, like them, an orphan. Led by the Pirate King, all raise their voices in praise of Poetry. It's Chorus number 7 on page 39, and is preceded by a short recitative. We'll now give you a bit of a break from singing, while we present some solo and ensemble items. One thing I didn't tell you about our conductor is that he's a final-year chemistry student at Oxford University, and he's asked me if he could tell you what his subject is all about. I'd also like to sing you something from Pirates - here are my helmet and truncheon. Please join in the refrains. 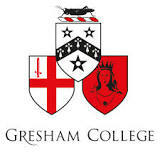 Because this is Gresham College, where lectures were originally given in both English and Latin, I'm going to sing it in Latin. 7. Solo with chorus: When a felon's not engaged ? After The Pirates of Penzance came Patience, a skit on the then-current aesthetic movement of Oscar Wilde and others. The story concerns the poet Reginald Bunthorne, who is madly loved by the maidens of the village to the evident disgust of the 35th Dragoon Guards to whom they'd been engaged only a year earlier. The Colonel, Major and Duke are forced to become as aesthetic as the love-sick maidens. By this time the G & S operas had become so popular that Richard D'Oyly Carte built a special theatre for them. This was the Savoy Theatre, the first public building in the world to be lit by electricity, and the shows soon became known as the Savoy Operas. Patience moved into the Savoy in October 1881, and the first new opera to open there was its successorIolanthe, a story that combines fairyland and Parliament, and includes some of Gilbert's wittiest lines and Sullivan's finest music. We present the Act 2 trio 'Faint heart never won fair lady'. Iolanthe's successor was Princess Ida, which the Oxford University G&S Society recently performed to great acclaim at the International G&S Festival in Buxton. Containing some of Sullivan's finest music, it's based on Tennyson's The Princess, which in turn was a skit on the new women's colleges that were then opening up in Oxford and Cambridge. Princess Ida, who was married in infancy to Prince Hilarion, has founded a women's university that rejects men entirely. Hilarion, with his two friends Cyril and Florian, enter the college to claim his bride, and dress up as women undergraduates. But Cyril gets drunk and gives the game away in his celebrated 'kissing song'. Princess Ida was not a great success and was succeeded by revivals of earlier operas. The partnership, about to break up, was saved by a chance happening - a Japanese sword in Gilbert's house became dislodged and fell to the floor. A Japanese exhibition was taking place in London and everything Japanese was fashionable. Gilbert had an idea - and The Mikado, or The Town of Titipu, was the result. The words of the 'Little list' song were written by Glenn Wilson, Gresham's Visiting Professor of Psychology. The Mikado, Gilbert & Sullivan's most popular opera, ran for 672 performances and gave them the chance to follow other pursuits. It was eventually succeeded by Ruddigore, a take-off of Victorian melodrama, concerning a family with a curse on it, requiring the current holder to commit a crime every day for life. Although it contains much excellent music and the finest scene in the whole of G&S, in which a whole gallery of portraits comes to life (as inAges Ago), Ruddigore was not popular. More successful was its successor, The Yeomen of the Guard, their most serious and possibly their finest work. It concerns Elsie Maynard, a strolling player, who's engaged to Jack Point, a jester. They need to raise some money for her invalid mother, and Elsie's offered a hundred crowns if she agrees to marry a courageous soldier, Colonel Fairfax, who's about to be beheaded. After the marriage ceremony has taken place, Elsie sings of her mental torment. The last G & S success was The Gondoliers, probably the sunniest of all their collaborations. It concerns two gondoliers, Marco and Giuseppe, one of whom is believed to be the King of Barataria, but no-one can decide which. They're sent to the island of Barataria to wait until the King's foster-mother can come to identify the right one. After three months there, Marco misses female company and sings his famous aria 'Take a pair of sparkling eyes', incidentally written by Sullivan at 5 a.m. at the end of a marathon 12-hour composing session. It's high time you had another chance to sing, so here's the finale chorus of the opera, 'Once more gondolieri'; it's Chorus number 25, on page 190. During the run of The Gondoliers, Gilbert, Sullivan and D'Oyly Carte fought a disastrous legal battle over the cost of a carpet for the front of the Savoy Theatre and, sadly, things were never quite the same again. In the 1890s, they wrote two further operas, both of which contain some fine music, but neither was particularly successful. The first of these wasUtopia, Limited, a witty and biting satire on many of England's institutions. Zara, the daughter of the King of the island of Utopia, has just come back from Cambridge determined to remodel Utopia on English lines, to the horror of the King's two spin-doctors, Scaphio and Phantis, who sing of their displeasure. We follow this with the chorus 'Eagle High', which (like 'Hail, Poetry') reminds us of Sullivan's life-long involvement with church music. It's Chorus number 26, on page 196. Gilbert & Sullivan's last opera was The Grand Duke, of which we'll say nothing except that Rudolph, the Grand Duke himself, is obviously suffering from every kind of illness under the sun. Sullivan died in 1900, while Gilbert survived until 1911, drowning in a lake in his Harrow home while trying to save the lives of two young ladies who were swimming there. But we'll end on a happier note, and conclude this evening's concert with a fine double chorus from The Pirates of Penzance, where the Sergeant of Police is valiantly attempting to rally his nervous band of men to face the evil pirates, while the Major-General's daughters inspire them to 'go to glory and the grave'. It's Chorus number 8, on page 40.